© Scott Rylander, Henry Proffit as the murdering thane. You have to hand it to young companies taking on the Bard, especially Macbeth. More often than not, Shakespeare’s tale of ambition and conscience, one of several pointing up the catastrophe that befalls anyone attempting to murder their way to the crown, requires at the least an actor capable of carrying the psychological journey the naughty Scottish thane travels upon with Lady Macbeth. 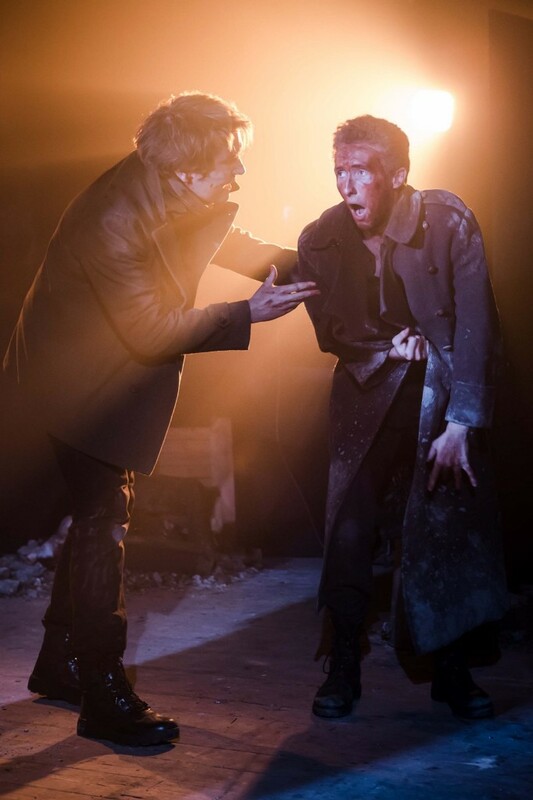 You can either decide to turn it into a chillingly intimate chamber two-hander as Trevor Nunn triumphantly proved more than forty years ago with Ian McKellen and Judi Dench. Or you can go the full monty as Ninagawa did in his sumptuous, Samurai version, recently returned to London in full glory. 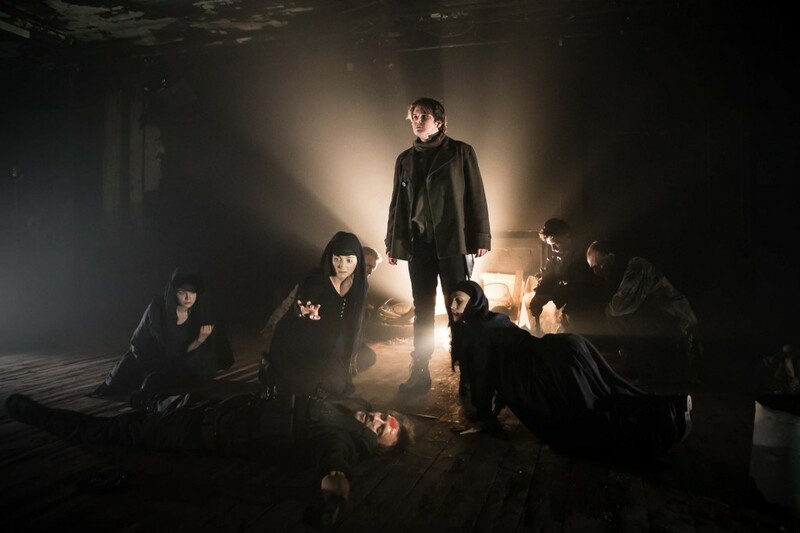 Devil You Know theatre company director, Paul Tomlinson describes his setting as `post apocalyptic’ and certainly Peckham’s Bussey building lends itself to such a concept. Designer Mike Lees gives us a suitably dusty setting of rubble and destruction all too suggestive of recent tv news footage from Raqqa or Mosul. Civilisation crushed into annihilation. Tomlinson dresses his Scottish adversaries in desert squaddie gear. A bloody, weary band, judging by the later battle scenes, they’re still capable of giving a good account of themselves with axe, dagger and blood-curdling cries. So far so good. But as so often with Shakespeare, it’s about the verse and what happens to the sense the words and its rhythms make and how they draw us in. 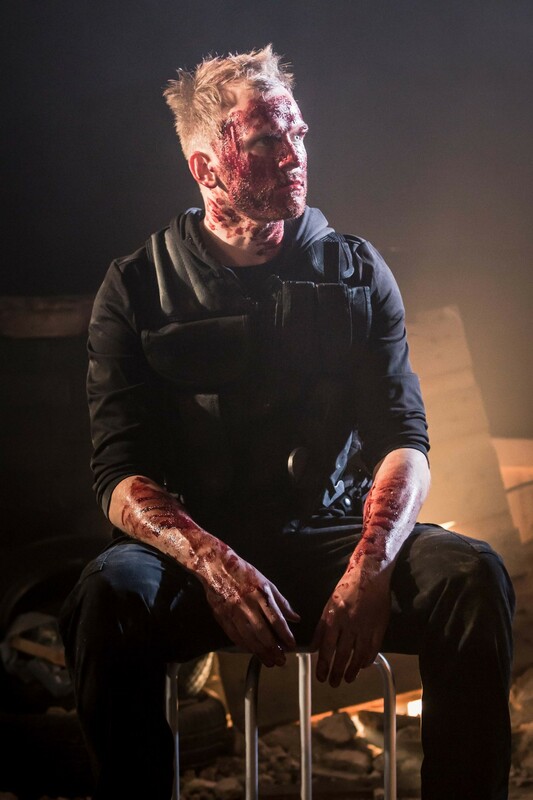 Macbeth, acutely, demands an amazingly subtle combination of warrior, vulnerably fluctuating emotions, a touch of psychopathic killer and finally exhausted, despairing resignation. 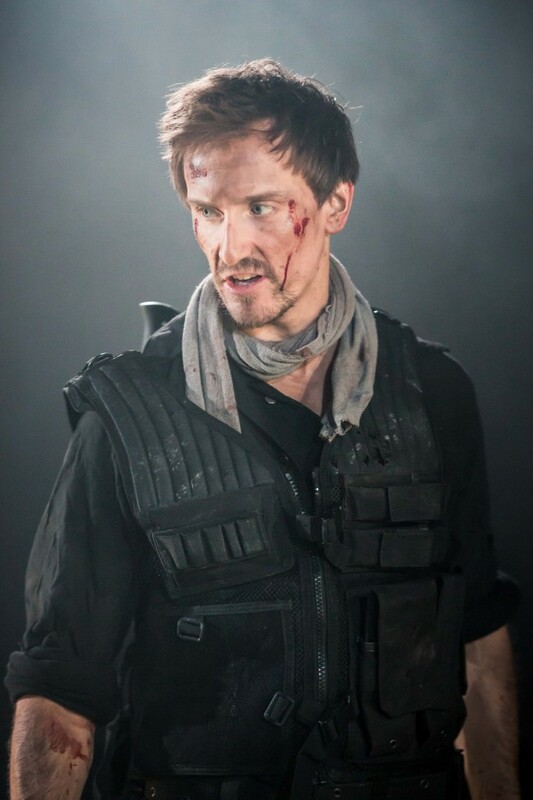 Henry Proffit’s Macbeth starts off promisingly. He speaks well, confidently, carries a certain swagger in his scrubby leather coat. And there is strong support from Cameron Crighton’s Banquo (a dead ringer for a young Daniel Craig) and Sadie Pepperell’s Lady M dressed as if hinting at the schemer that lies beneath the smile. But alas and alack, though there is nothing intrinsically wrong with the production – indeed it follows an all too conventional line – and the company is earnest enough, there’s nothing particularly enthralling or illuminating about it either. 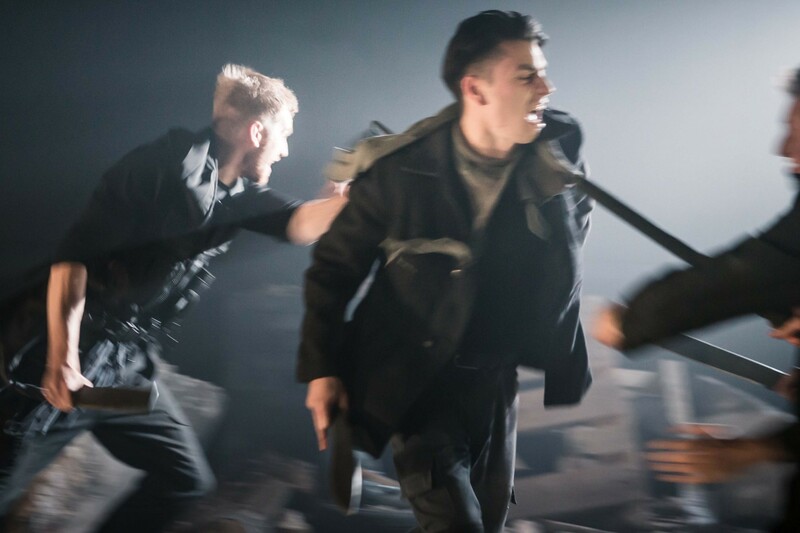 Tomlinson has a firm hand on the extras such as sound cues, lighting and battle scenes – and everything is in place for what could have been an absorbing two hours. I can still remember an outstanding Othello in this same space a few years ago with a young company that for piercing freshness and intelligence still bears up in the memory against better funded and far more illustrious successors since then. In the end, it’s good, solid and unselfish team work with sturdy performances from some of the older members such as James Pearse’s kindly Duncan and Tony Portacio’s Ross. Guy Dennys’s Malcolm, Jake Sullivan’s Angus and Danielle Bond’s Lady Macduff too hold out promise of better things to come as do the two youngsters playing Lady Macduff’s son and Fleance respectively – Quentin Debone and Adam Nkomo. 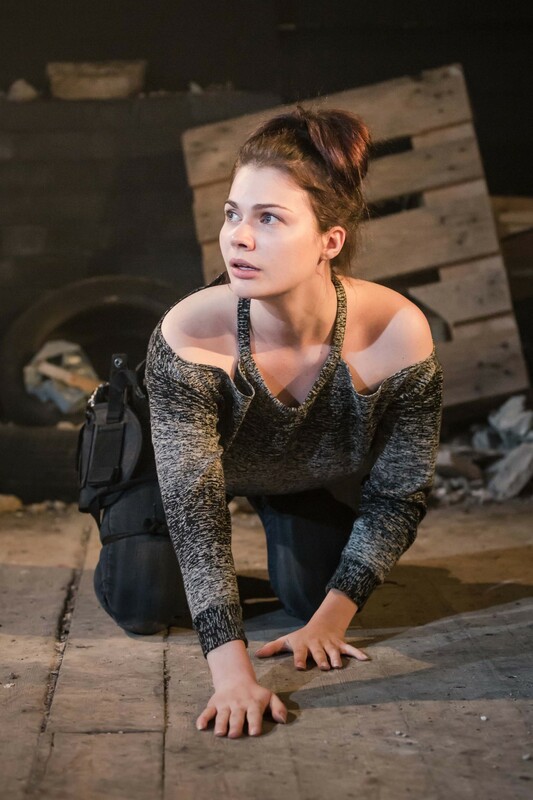 This entry was posted in 2017, Reviews and tagged battle scenes, Bussey Building, Devil You Know theatre company, Mike Lees, modern dress, Paul Tomlinson, post-apocalyptic, Shakespeare, young company on November 3, 2017 by Carole Woddis.